This morning’s Meet The Press began with Chuck Todd’s latest poll numbers showing an incredibly tight race. The tightest states overall, the ones which will ultimately decide the election, are Colorado, Iowa, Wisconsin, and Ohio. 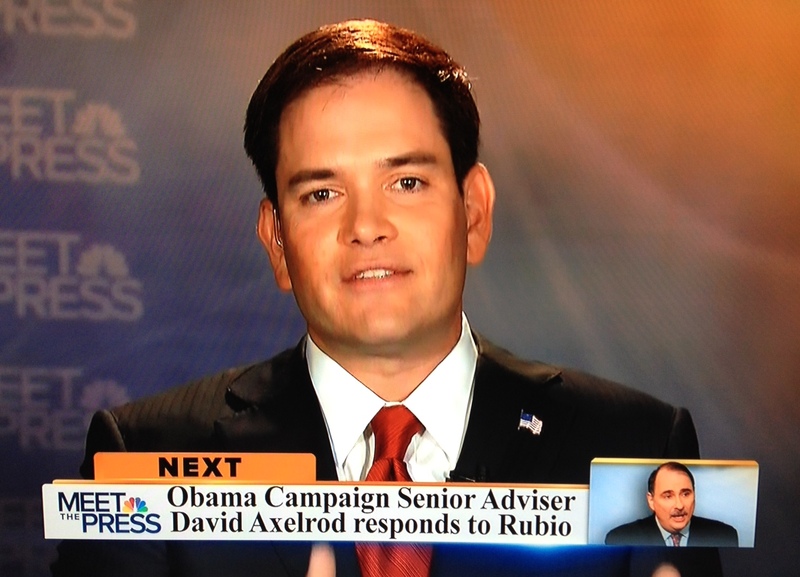 First up was Senator Marco Rubio (R-FL). Host David Gregory asked him about the story in today’s New York Times that the United States and Iran were about to begin one-on-one talks regarding Iran’s nuclear program. Rubio said, “The White House has denied it which means there isn’t much to talk about.” However, Rubio did say that a President Romney would pursue all diplomatic options before resorting to military action against Iran. Gregory laid out Governor Romney’s contradictory remarks on contraception. Rubio says Gov. Romney supports an exception for religious employers to opt out of providing contraceptive coverage, despite what the candidate said at the most recent debate. No new ground was covered on abortion. Rubio defended Gov. Romney’s comments on women in the work place. Gregory pressed the idea that if the Romney/Ryan proposals for reform on Social Security and Medicare are so good, why not implement them now? Rubio gave a strong defense of the plans. In the roundtable, the New York Times’ Tom Friedman said the Benghazi controversy is “utterly contrived.” He wishes that the campaigns and the media would give equal attention to the more amazing story that in the days after the attack on the US consulate, thousands of Libyans marched in support of the United States carrying pictures of slain US Ambassador Christopher Stevens and mourning his death. Gregory showed a quote from the Weekly Standard wondering why a New York Times reporter could interview one of the alleged masterminds of the Benghazi attack, but this person has not been approached by US or Libyan government investigators. In the middle of the roundtable, Gregory brought in Senator Rob Portman (R-OH) live from Boca Raton, FL. This was odd since the broadcast had featured an even number of campaign surrogates up until this time. So it was strange to drop in an extra Romney supporter. On the other hand, it may not mean much since Senator Portman added nothing new and could not offer the economic specifics pushed for by Gregory. Former Clinton White House Spokesman Dee Dee Meyers said the Romney campaign has been all over the map on the issues of contraception and abortion. Meyers says the “get out the vote” effort will be the key to victory in Ohio. The program ended with a tribute to the late Senator George McGovern. McGovern died early this morning; he appeared nine times on Meet The Press during his distinguished career of public service.